We can limit the spread of water vapour by closing doors while showering, bathing or cooking. We can install moisture sensitive extractor fans in the source areas (kitchens, bathrooms). 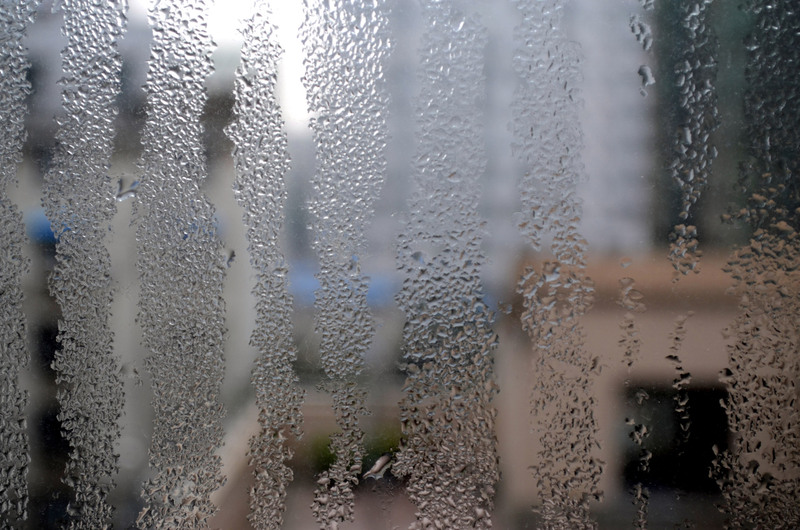 Humidity should be between 30 – 60% depending on the time of year (30% during dry months, 60% in wet months). Opening windows or window vents will usually equalise the indoor humidity with that outside and that is usually (but not always) sufficient to prevent problems with damp indoors. If you can only open windows for a short time, it is often beneficial to open a window at one side of the building and another at the opposite side as this encourages good airflow through the entire floor of the building. Some older properties (e.g. those with outside walls that have no cavity preventing moisture passing through to the inside wall) can still have problems when the weather is cold. In these cases keep an eye out for mould, particularly in areas where there is little air circulation (e.g. behind cupboards or even in cupboards, if they are built in and use the outside wall as the back of the cupboard). Remove any growing moulds using an antifungal disinfectant or, if you cannot find an alternative, 10% household bleach is effective (Suggested guidelines and limitations here). Some properties will have mechanical ventilation (MVHR) that provides a constant flow of outside air into a building and recovers heat from outgoing moist indoor air – these can be very effective in reducing humidity while retaining warmth in a home (better than opening windows in cold weather!) These units can be fitted in homes experiencing problems with damp and can help reduce damp. Again there are a range of types of these units and advice should be sought from a trusted expert in ventilation before fitting – contact Chartered Institute for Service Engineers (CIBSE – UK or global) or ISSE. If you can’t find an alternative disinfectant and don’t want to use one of the irritant disinfectants listed above then you might follow guidelines suggested by the US EPA which suggests just using a simple detergent and thoroughly drying the wetted surfaces. If you can increase permanent ventilation in the affected area to reduce damp further then do so. Seek professional advice (RICS or ISSE) to try to eliminate the damp. NOTE: moulds are only one source of health hazards in a damp house, there are several others e.g. bacteria can also grow in a damp home and be breathed in, odours and other volatile chemicals are known to be irritant. Eliminating the damp should reduce the sources of many health problems! We have noticed that many people who live in damp homes are in dispute with their landlord. Often the landlord claims that the tenant is responsible for the damp and in the UK that is often partially true as some tenants refused to adequately ventilate their homes in winter. However, there are often measures that the landlord can take too. We think a compromise needs to be reached and in the UK there is a housing ombudsman service who can mediate these disputes.